LSF | S&P Canada Ventilation Products, Inc.
Supply air to over 13,000 CFM in static pressure capabilities to 2" w.g. 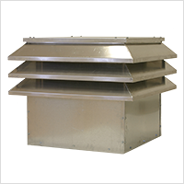 LSF's are used to replace exhausted fumes, vapors and gases with fresh, filtered make-up air in commercial and industrial applications such as manufacturing and assembly areas, kitchens, athletic clubs and many others. 9 24-1/2" 37-3/4" 23-3/4" 16-1/8" 24"
10 28-1/2" 41-3/4" 23-3/4" 16" 28"
12 28-1/2" 41-3/4" 30-1/2" 16" 28"
15 32-1/2" 45-3/4" 32" 18" 32"
18 36-1/2" 50" 38-5/8" 23" 36"
20 51-1/2" 65" 47" 26" 51"
Note: Additional accessories are available for certain products. Contact your S&P Representative for more information about these accessories.